Back on Valentine’s Day, I showed some four-patch hearts that I had been working on. The project is all finished up now! 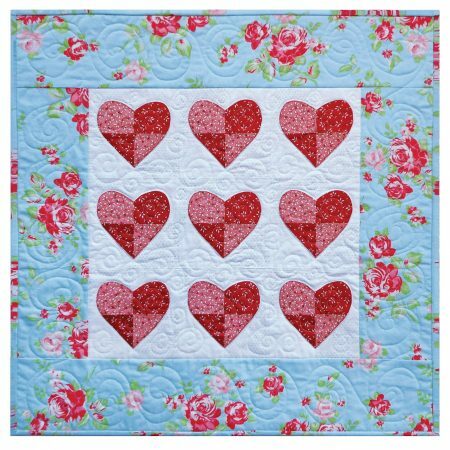 The hearts are made from four-patches (and the backgrounds too). Gives them a little zing! The pattern for I Heart You is available in my Etsy shop or on my website, links below. What a sweet little quilt! The border fabric is gorgeous! Thank you Carolyn! I got the border fabric at Family Threads in San Juan Bautista, California. The sweetest little quilt shop if you’re ever in the area. Your designs are always so clean and crisp. Darcy, I take that as the biggest compliment ever!